Washington – Tea Party-backed Republican members of the House of Representatives announced a new proposal to overhaul the country’s immigration policy Monday, including a radical new offer that would grant immigrants in the United States illegally a pathway to legal status. However, the immigrants would have to pave said pathway themselves, and would be capped at a maximum salary of $2.25 per hour for the work. 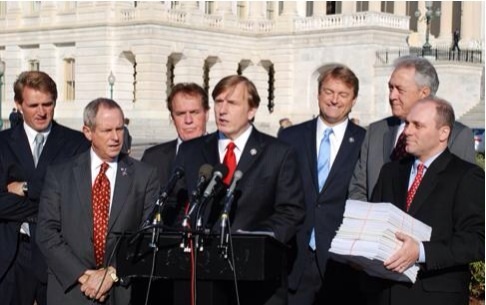 “We want to move this country forward to a sensible immigration policy,” said Louisiana Congressmen John Fleming. He was flanked at an afternoon press conference by other members of the Tea Party Caucus, including Joe Wilson of South Carolina, Phil Gingrey of Georgia and Steve Scalise, also from Louisiana. Rep. Gingrey reiterated much of what his colleague had already said, but also added that other measures that have been put forth by members of Congress to try to deal with this issue are wrong-headed and naive.